OK… so the exploration is continuing into the new equation which I am calling “The Cobra Equation” because the 3D curve looks like a cobra. This equation shows promise in its ability to explain the process of the business cycle and to ascertain the utilization of labor and capital near the end of the business cycle. MFP = marginal factor productivity (assumed $50 in video). a = coefficient of labor share to establish effective demand limit on capacity utilization. Coefficient a = 0.88*s^2 – 2.31*s + 1.95 … (s = effective labor share, for example 80% as 0.80). 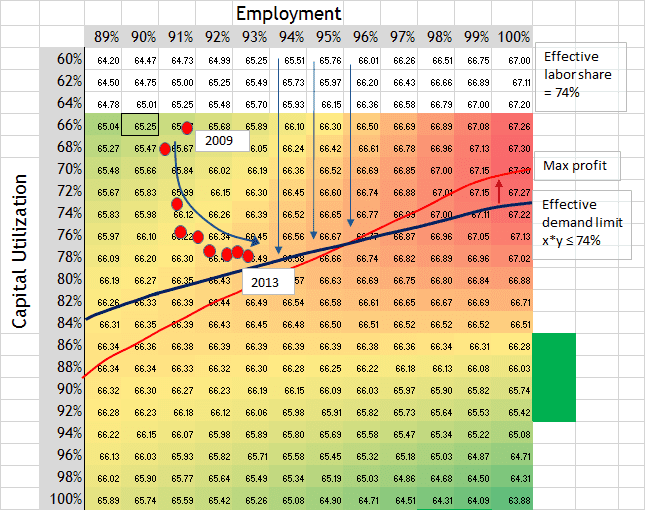 Notes to video: The constraint is x*y ≤ effective labor share. I say 74% in the video, but effective labor share can change. 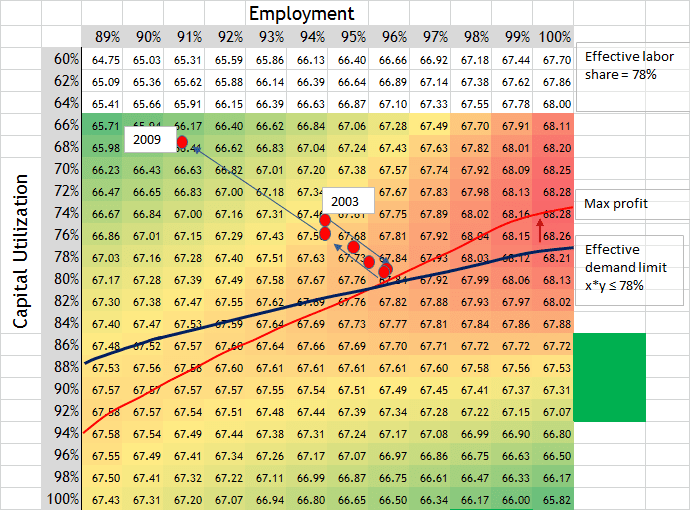 Also, the numbers in the Excel spreadsheet include the MFP, marginal factor productivity of $50, in the equation. The 3D graphic equation did not include the MFP. The video explains how the economy is moving within the constraint of the effective demand limit as firms reach for profits along the profit maximization line. The capacity utilization rate will stay steady or decrease as the economy moves forward toward the end of a business cycle. For example, capacity utilization has already stayed constant for almost 2 years. We may be sliding backwards as far as capacity utilization. This equation is new so we have to watch it. Even so, the video explains the process of the business cycle moving in a circular motion on the plot. As you follow the red dots from 2003, they slightly swoop in and look like they will start heading up and to the right on the profit max line, but the recession started at the end of 2007. Note: The above graphs use MFP constant at $50, but even if MFP was to change, the Maximum profit line (red line) would not change position. One thing I forgot to mention in the video, which is a very important point, is that Keynes stated that the effective demand limit was related to the maximization of profits. He stated that an entrepreneur’s expectation of profits would be maximized at the effective demand limit. When we look on the graph and see the two lines, one for effective demand limit and one for profit maximization, we see a close relationship between them. They are not the same, but they move close to one another even as labor share changes. We may find through further research that the economy tends to head toward their crossing point. I find the ideas intriguing. But I have difficulty following the time line, partly, I suspect, because the box graph/spreadsheet has only two axes. The red dots are supposed to capture time line data, but the presentation becomes opaque and difficult to follow. I am aware that the cobra graph is 3-dimensional, but I still have difficulty with seeing the timeline there. You are presenting a timeline that apparently describes a repeating event ( a circle ); you might want to consider a graph more sinusoidal. The Y-axis is the time line. The x-axis then becomes the solution of the two variables as that solution changed over time. Using the graph form you did–both the cobra and the box– does help to demonstrate the theoretical principles involved, especially since the theoretical solution set to x and y can be broad, i.e., many possible solutions. Nonetheless, when discussing the timeline, you might want to consider my suggestion. Hope I made sense. Not sure that I did. 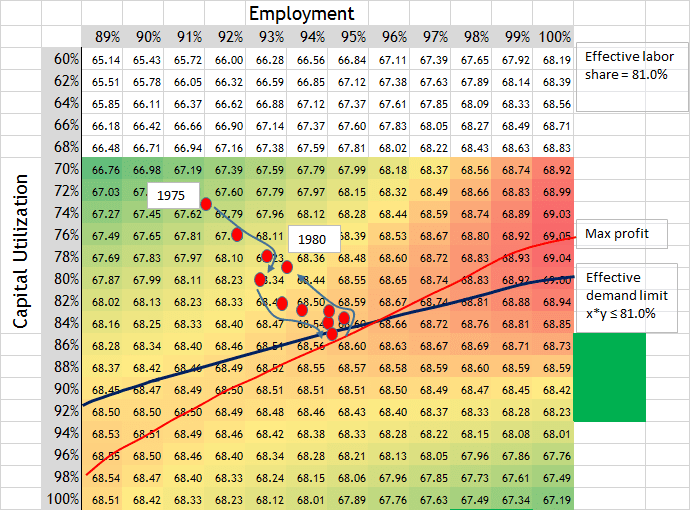 The red dots are coordinates for employment and capital utilization as they move through the profit numbers. The red dots move to higher numbers of profit until they reach the limit. You say that there is a timeline, yet through time the coordinates of capital utilization and employment. The timeline is how the economy moves through the profit numbers. At the limit, capital utilization slows down, and increased aggregate demand from more employment would create an inflationary pressure. Then the destiny of a recession depends on if people still feel optimistic and whether the Fed over-reacts to the inflation. But I hear you about a sinusoidal graph. That is a good idea.